The Vice President of the European Commission has pleaded with supporters of Brexit to respect the Good Friday Agreement, telling a plenary meeting of MEPs in Strasbourg that it is "completely irresponsible" to brush it aside. 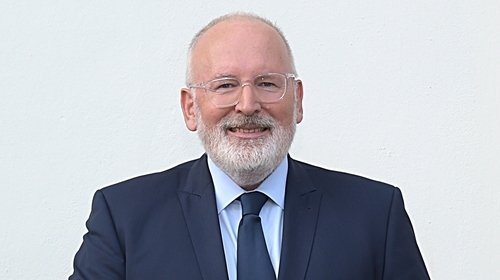 Frans Timmermans said the accord was one of the most historic achievements of the UK, the European Union and Ireland. "How is it possible that people coming from the United Kingdom maintain that there is no link between the European Union and the Good Friday Agreement?," he asked. "The European Union is integral part of the success of Good Friday Agreement. It would not have been possible without the EU. And you cannot just brush away that responsibility which is a collective responsibility," he said. "We are all responsible to maintain that legacy and prevent the island of Ireland going to a past that I knew as a young man and I hope I will never see again," he added. He said the issue of Ireland was central and there was a responsibility to do as little harm as possible. "And just to brush it aside in London is completely irresponsible," he said. Earlier, Commission President Jean Claude Junker said the EU is committed to sticking to its policy of "Ireland first" in the current Brexit negotiations. He told MEPs that the bloc wanted a deal, and warned that those who were suggesting a no deal Brexit were not aware of the difficulties this would bring. DUP MEP Diane Dodds criticised the EU's demand for a backstop, describing it as a "sword hanging over the outcome of the negotiations". She said the bloc was making "impossible demands" and that the idea that Northern Ireland would be allowed to become a "semi-detached" part of the UK was "offensive and outrageous". Sinn Féin MEP Lynn Boylan accused some members of the Conservative Party of using the issue to "score points in their internal party battle". Fine Gael MEP Seán Kelly said people were playing to the gallery, and was among a number of MEPs to call on UK Foreign Secretary Jeremy Hunt to apologise for likening the EU to the Soviet Union. Independent MEP Luke Ming Flanagan also told critics of British Prime Minister Theresa May, including German MEP Elmer Broc, that he was making the situation worse. "I'm no fan of Mrs May, no fan of the Conservative Party, but it doesn't help you coming in here and questioning whether their Prime Minister is legitimate or not. It's up to them to decide," Mr Flanagan said. Meanwhile, the leader of the Parliament's Brexit negotiating team, former Belgian Prime Minister Guy Verhofstadt, warned against any extension of Article 50, saying this would only bring further uncertainty.